Government agencies looking to make better decisions from the data they collect have more resources within reach than they might suspect. But senior leaders need to take steps to identify the hidden data champions in their midst and encourage them to become catalysts in their organizations, according to a new report. “Data and analytics catalysts,” are those who have a “natural ability to drive change,” and are given the necessary foothold to help an organization understand the value of a “data-driven enterprise,” the report says. The report, released by Booz Allen Hamilton, suggests the most promising candidates are those who have instinctive leadership skills, have a flair for making sense of data, know how to engage stakeholders and are able to nurture talented individuals to join in their initiative. Agencies don’t need to create new positions or add staff, the report says, but focus instead on developing the talent and interests of employees within their organizations. By identifying data and analytics catalysts, agency leaders would benefit from more clearly defining mission goals when they have data analytics to support their decisions. The report highlights four ways agency leaders can help empower those individuals and how to focus their efforts. It also argues that it isn’t enough to simply acquire technology that sifts through the data. Those tools are important for streamlining and presenting data analysis, but they often fail to address a more fundamental need — having a workforce that can make sense of the information. Agencies can often assume that having a data governance structure in place will foster better use of data. But it can only be successful when there are catalysts in the organization who can analyze the data and spell out the trends in a way that informs and shapes mission critical decisions. 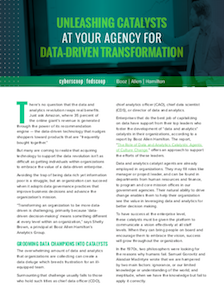 “Transforming an organization to be more data-driven is challenging, primarily because ‘data driven decision-making’ means something different at every level within an organization,” says Shelly Brown, a principal at Booz Allen Hamilton’s analytics group. For an organization to get the most of out the information they have, catalysts should exist in every department within an agency. The report also encourages management to assess the amount of risk the agency is willing to take and give catalysts the space needed to innovate within appropriate guidelines. Agencies that fail to build data and analytics skills among their staffs risk not only missing unseen opportunities to better fulfill their missions, but also risk seeing the value of their data diminish over time, or worse, wasting a precious asset. Read more about empowering your workforce to put data and analytics to use. This article was produced by FedScoop and CyberScoop for, and sponsored by, Booz Allen Hamilton.